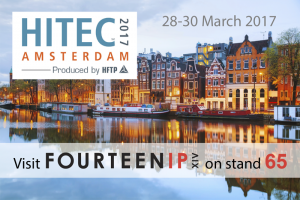 If you haven’t already booked your place at HITEC’s first European hospitality and technology conference in Amsterdam, you need to think about doing so. The Fourteen IP team will be at the event on stand number 65. Being held at the RAI Amsterdam Convention Centre on March 28th-30th, 2017 the world’s largest hospitality and technology conference offers us an excellent opportunity to meet up with existing and potential customers from across Europe and showcase our EVOLUTION Family of cloud telephony and networking services designed for the hospitality industry. HITEC conferences in the United States bring together over 5,500 individuals from the hospitality technology community and is held in a different city each year.